From Paris to Kathmandu through Muscat. From France to Nepal through Oman. Flying from Paris to Muscat was an average trip. No, it was nothing compared to the journey back and that “curry tale”. But we will come back to this later. We just landed in Kathmandu at the end of July. Due to pollution and heavy rain, it was already quite dark when we exited the airport. We had the good sense to look up some info online before departure. And it was not more complicated than anywhere else in Asia to divide the taxi fare they announced by 4, to reach Thamel from the airport. You will find lots of touts offering to carry your bag for tips and I will advise you to walk 100 meters to the road to avoid the hassle. As everybody is almost heading to the same direction, ask your fellow foreigner to share a cab and split the cost. Your second option is to take a prepaid taxi, KTM Airport management committee has committed to providing 24-hour service. You will find it after the tourist info center just before you exit the airport (expect to pay twice the average taxi price). If you do so, don’t be surprised as you may have somebody from the agency in the same taxi. They will try (not force) to recommend you some travel packages and info about the tourist activities in Nepal. 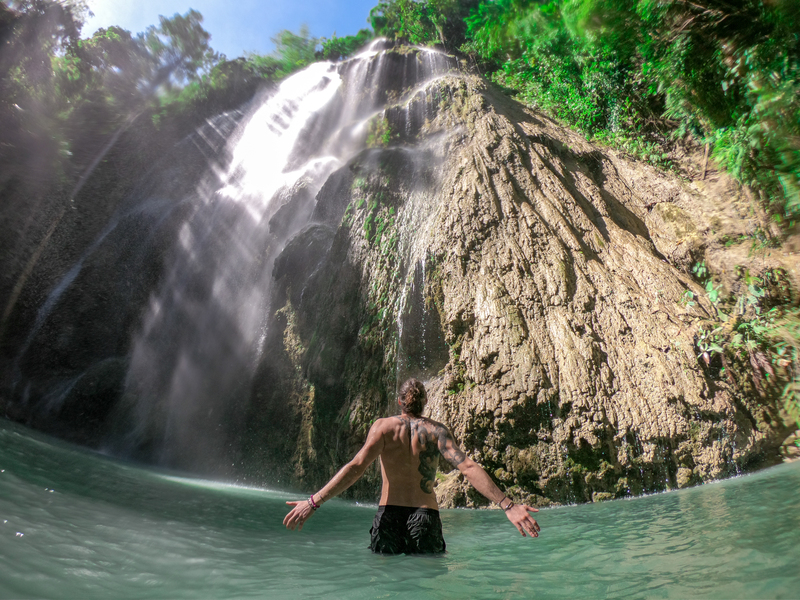 The info are valuable and you are always free to find your own travel agency if you need one later. You can always enjoy the public bus for a fraction of the price, but it means to have change, time and some precise information as there is no direct bus to Thamel from the airport at the time this article is written. We just booked a night on arrival, enough time to figure out what our plan will be next. We stayed at Kathmandu Home Hotel the first night then Peak Point Hotel for the rest of our stay in KTM. Amenities were quite basic but we managed a good deal with the latter, including breakfast, plus they kept our luggage while we went on the Annapurna Base Camp Trek. They also have a little “rooftop” to enjoy some beers. During our few days stay in KTM we had time to visit the main sights. This includes many temple and monasteries, we are just gonna list below the main one. Durbar Square means “The opposite place to the Royal Palace” in Nepal, Kathmandu Durbar Square is one of the 3 Durbar in the Kathmandu valley. All of them being UNESCO World Heritage Sites. We were lucky enough to visit it before the major April 2015 earthquake (7.9 magnitudes) when several century-old building had crumbled to ruins. The immediate large square is surrounded by Newari architecture, lots of temples, popular shrines and the old royal palace (Malla and Shah dynasty). Rebuild process began but It will take years before all of the monuments are back in shape. The bricks and wood nine-storey Basantapur Tower still stand tall, this earthquake survivor will give you a great view of the city from the top. 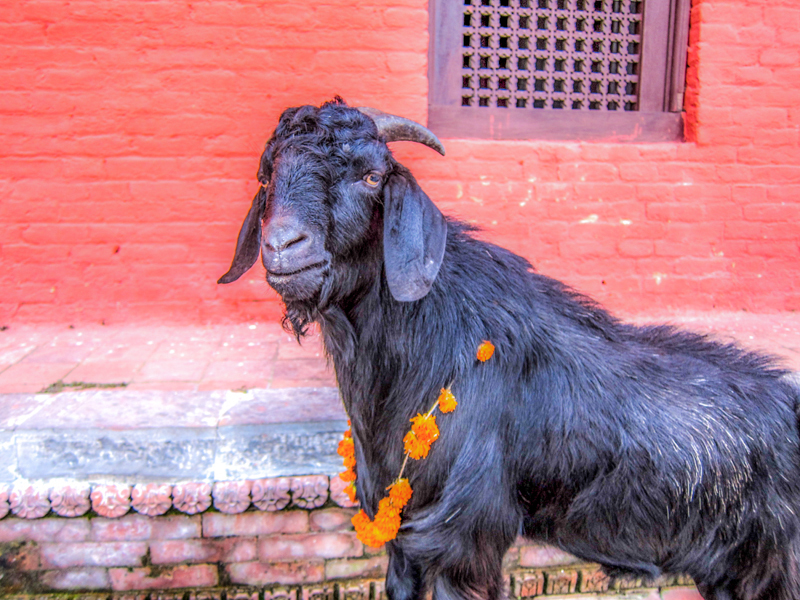 Since the 17th century, a tradition exists, the Kumari (“Virgin” in Nepalese). She is the incarnation of the Hindu Goddess Durga. There is few in Nepal, some cities having several, the most known one is the Royal Kumari from Kathmandu, living in the Kumari Ghar, in the Durbar Square. She has to be from a Goldsmith family. Recognize among several samples the clothes own by the last Kumari. Not show any emotions at any time. She must meet 32 strict physical requirements. Her horoscope must be complementary to the King’s. Last but not least, not to be frightened, when she does have to spend a night by herself in the dark, lit by candles with masked men dancing around the bloody goat and cow head just sacrificed for the ceremony. The little girl then become a Kumari and will only go out of the temple for ceremonial occasions, she can only wear red and is restricted from going outside of her residence, she will only appear briefly at the window. If you are lucky like us you could see her from the Kumari Chowk (no photo possible). Unfortunatly, when her time is done, the return to real life can be quite hard. As she was not granted to walk at all (the floor being impure for a goddess) they often suffer from their muscles being under developed . Most of the time they will not find a partner; a legend mention that any man who marries a former Kumari will die soon after the wedding. Entrance fee went up to 1000 NPR for foreigner people last year, but you should know that you can request a valid card for your visa duration, this way you could go more than once for the same price. The price might be too high now for Budget Travellers, considering the recent condition of the site. 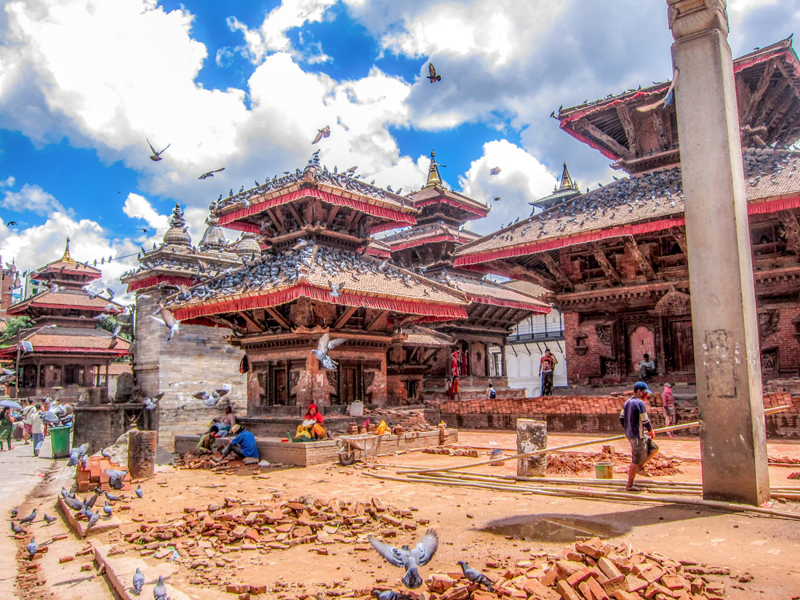 We suggest you take a day trip to the Patan’s Durbar Square, half the price, and no much damage. Tourists got targeted recently by scam artist, and when i say artist, you do need a lot of imagination to invente that one. Always keep your credit card with you and do not let it out of your sight when making purchases. 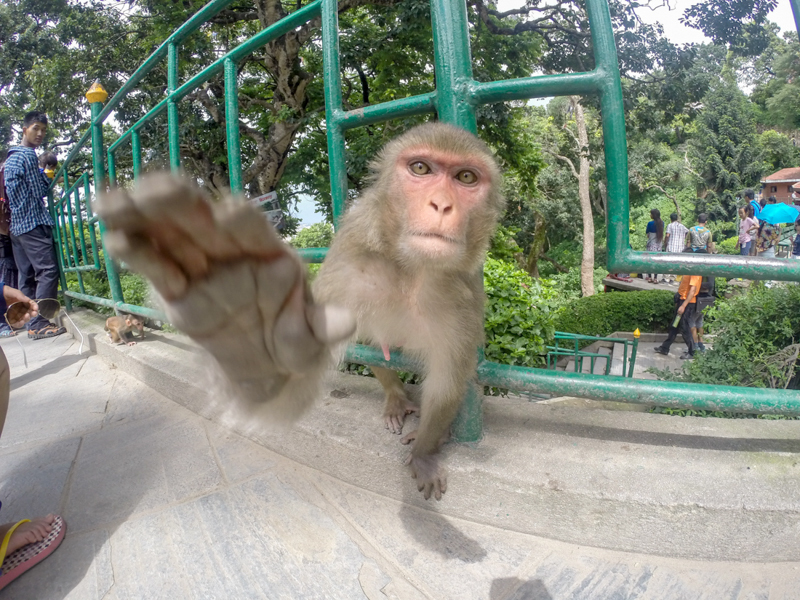 We didn’t told you that: The guard at the entrance will check for any tourist face. Remember that the entry fee will help reconstruct this Unesco World Heritage Site, but, if you go around the small street on the side of the square you could easily go in without going through the counter. 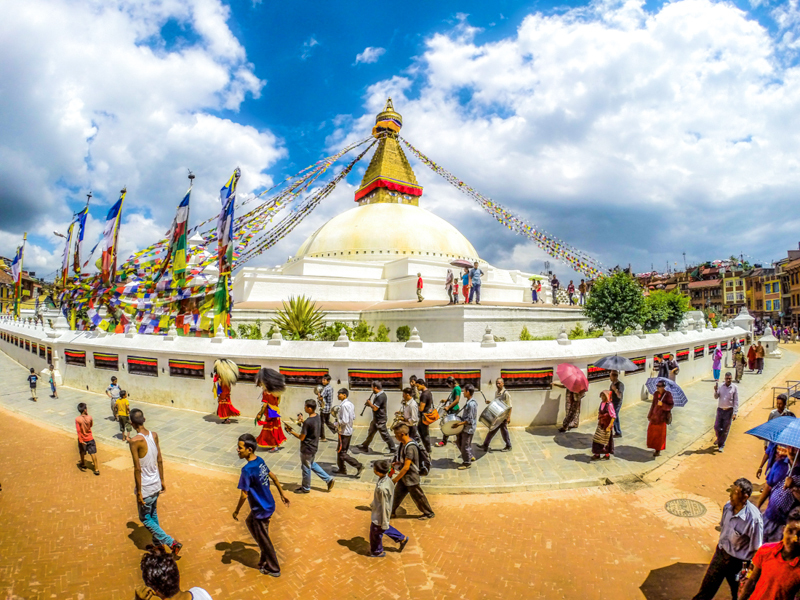 Located around 6 km from Thamel, Boudhanath’s stupa dating from the XIV century is one of the biggest in the world. The UNESCO site has a wonderful Mandala shape from the sky with his 3 terraces. 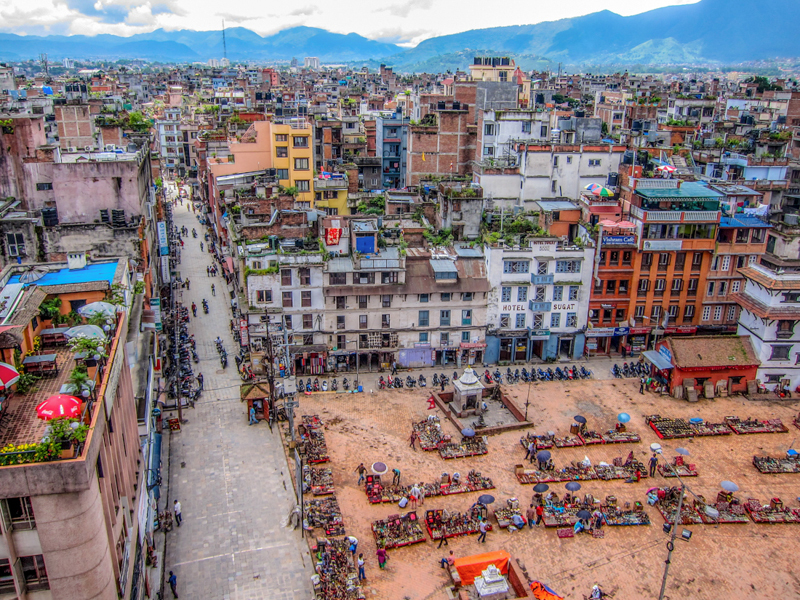 You should pay around 300 NPR to get there from Thamel with a taxi and about 40 minutes to walk on the way back if you want some exercise (20 NPR by bus). When you enter the area, to your left, you will see a building with 2 golden deer and a Dharma wheel at the top of it. Inside, if your timing is right. You can then enter the temple and receive a special blessing with a simple string bracelet, blessed during and tied on after the ceremony. Do not forget to make a donation, even a small one can help bring about a large change. 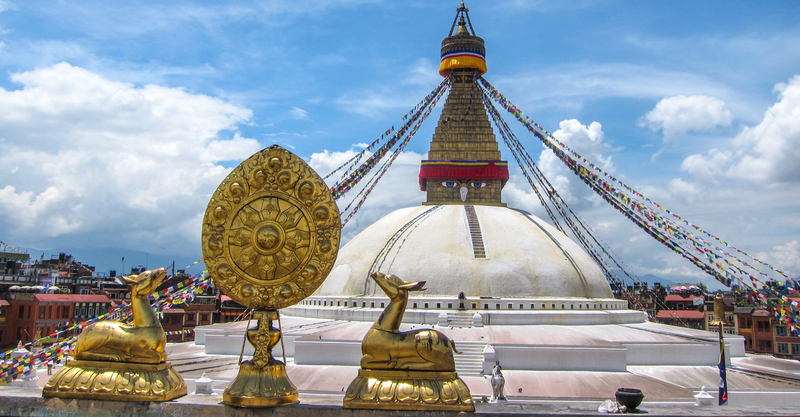 Boudhanath stupa reopens after restoration in November 2016. (Eighteen months after the earthquake in 2015). The story about the Bouddha Stupa is incredibly inspiring. The stupa was built, during the 5th century AD, by Jadzima, an old poultry woman. 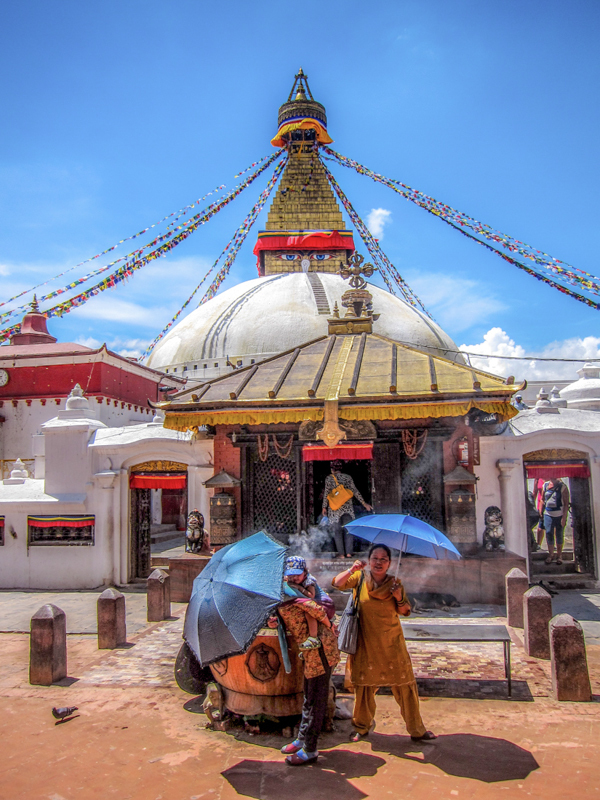 She wanted to build a stupa and asked the king of Nepal for land to construct a shrine to the Buddha. Normally, the king wouldn’t give such permission, but somehow, maybe due to her karma, the king said, “Yes, it can be done.” This just slipped out of his mouth. In Tibetan the stupa is named “Jarung Kashor Chörten”, Jarung means “it can be done” and kashor is “slipped out of the mouth”. Chörten means stupa. The king then offered her as much land as she could cover with the skin of a buffalo. The woman starts cutting a water buffalo hide into thin strips and placed them end to end to create a huge circle. The king realized that he had been tricked by the old woman, but keeps his promise, and the stupa was constructed according to these dimensions. The mother passed away after she completed up to the dome-like structure. She had four sons, which completed the rest of the stupa. 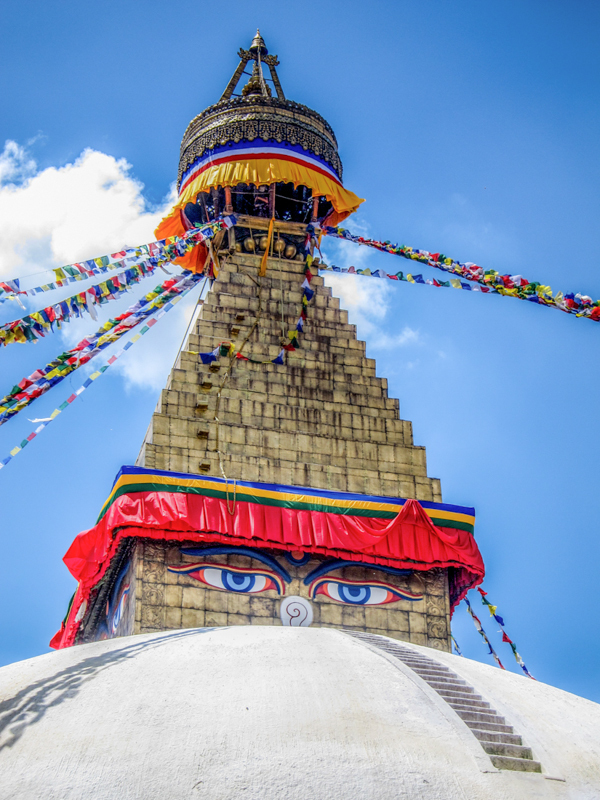 We didn’t told you that: Regarding Boudhanath stupa, the counter will close in the evening and you can then enter the site for free. But in our opinion for less than 2.5$, unless you are a Photo Enthusiast and want a special lighting, it is definitly worth paying for it. in Kathmandu . Situated on a hill, west of Kathmandu overlooking the city. Entrance fee will be 200 NPR. 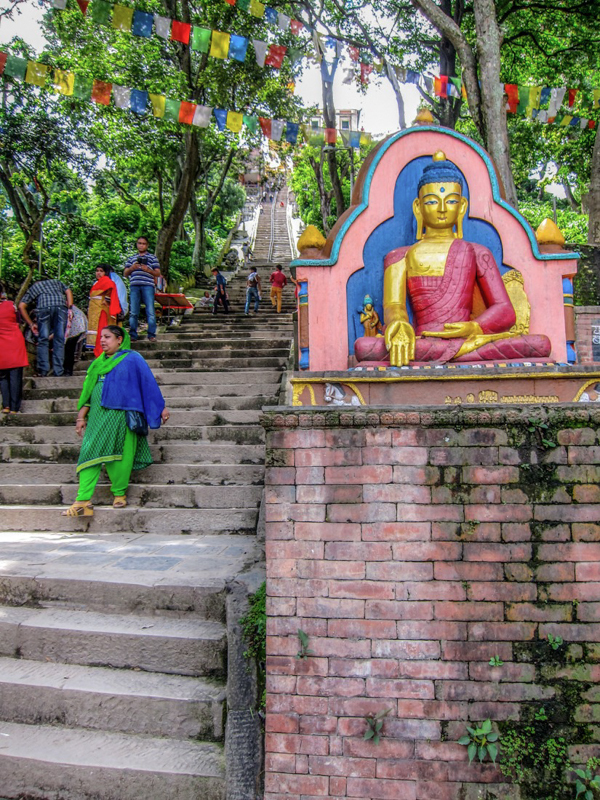 Swayambhunath was founded by King Vṛsadeva towards the beginning of the fifth century. up the hill and began a series of circumambulations (clockwise) around the stupa. 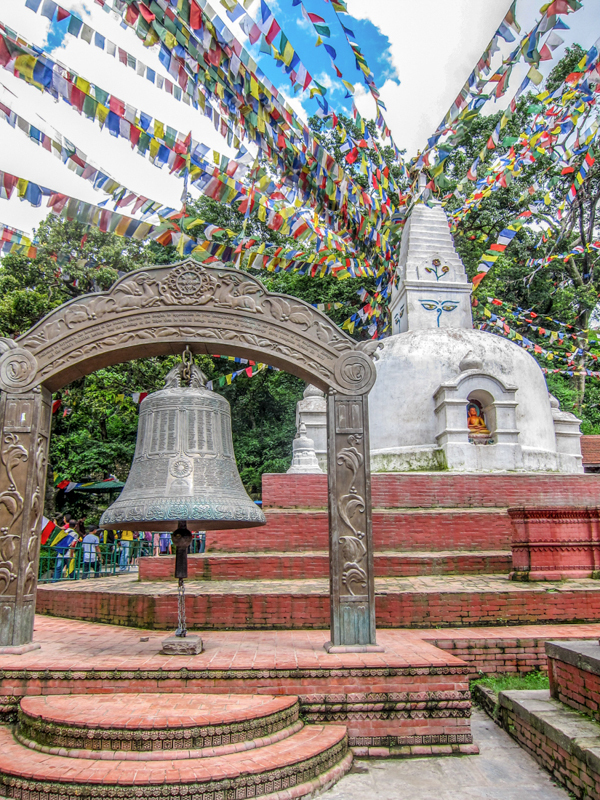 A prayer wheel is a cylindrical wheel on an axis, made of various materials. Traditionally, filled with mantras and able to turn freely; the most used being the Om Mani Padme Hum Mantra written in Sanskrit on the outside of the wheel. According to the Tibetan Buddhist tradition, spinning such a wheel will have much the same spritual value as orally reciting the prayers. The prayer being spread in the air as if It was prononced. The wheels are often aligned in a long series and set in motion one after the other. The Faithful moves the wheels with its right hand. And it must be rotated in the clockwise direction, so the mantra can be read in the direction in which it was written. 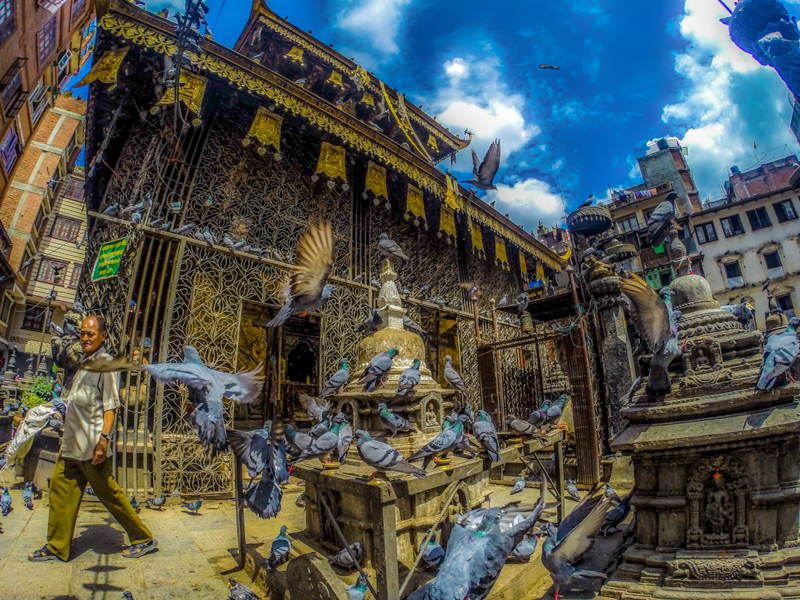 Pashupati area is in the banks of the Bagmati river, 5 Km NE of Kathmandu not far from the Airport. 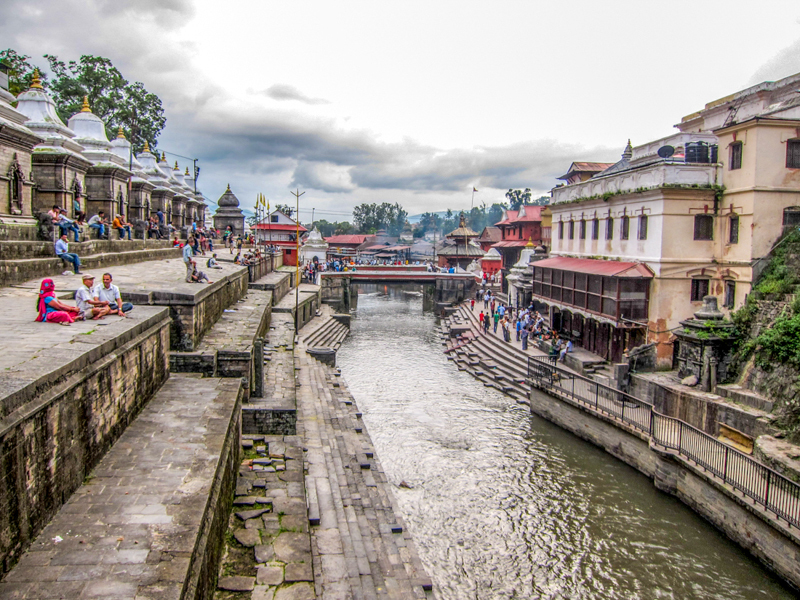 The Pashupatinath Temple earliest evidence dates back to 400 A.D, listed as World Heritage Sites by UNESCO. It is one of the sacred temples of Hindu faith. For foreigner, entrance fee is 1000 Rs (10$). You can easily stay hours in the area watching funeral rituals and visiting the many sightseeing. Only Hindus can enter the main temple. Depending on how wealthy and honoured the deceased person was, they will have the right to be burned closer to the Pashupatinath Temple. According to tradition, only the dead from the Royal Family were allowed to be burned in front of the temple. Luckily the site were not to much damaged by the 2015 earthquake. Sadhus are the Hindu holy men. Found throughout India and Nepal, they are seen begging in towns and cities. They are respected by Hindus and given food in return for their blessings and prayers. They are also known as Baba or Fakir (a holy man who lives by begging). Members of any caste can become Sadhus, originally only Brahmins were allowed to become one. Provide religious services to those in need. Taxi start on average at 250 NPR, count 43 NPR/Km and about 250 NPR for 1 hour waiting. Expect to pay around 400-500 NPR for a Taxi ride from the airport to Thamel (20-30 minutes) and twice that price for a prepaid Taxi. Of course, you should agree on the rates first. 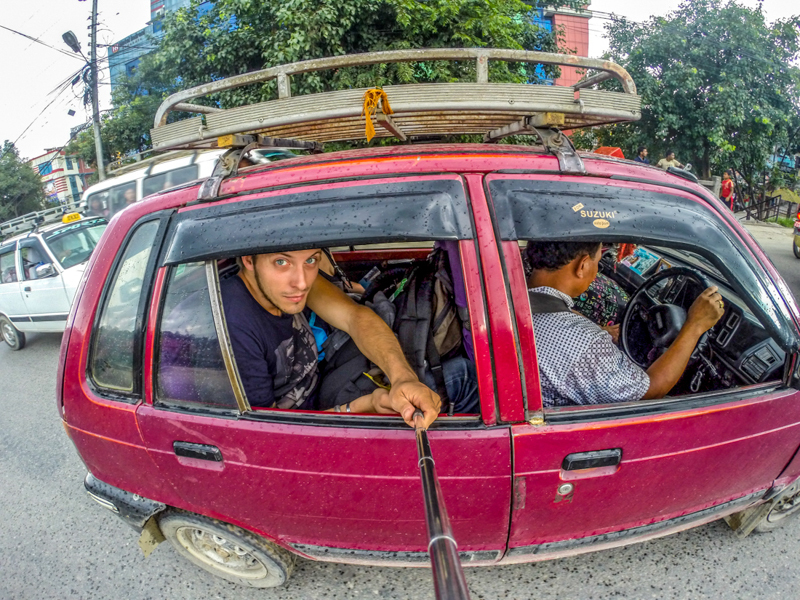 The taxis in Nepal do not run by the meter, so you will have to agree on the total cost immediately. Be sure your driver knows your final address destination, including the name of the hotel and/or street name. Trust us about this! Don’t hesitate to ask for info and tips, they might not speak the best English but they will know the best local places! It is generally a safe country and people are trustworthy, but it always takes few second to remember the taxi number or plates. Just in case you forget something inside. Entrance fee of 200 NPR. 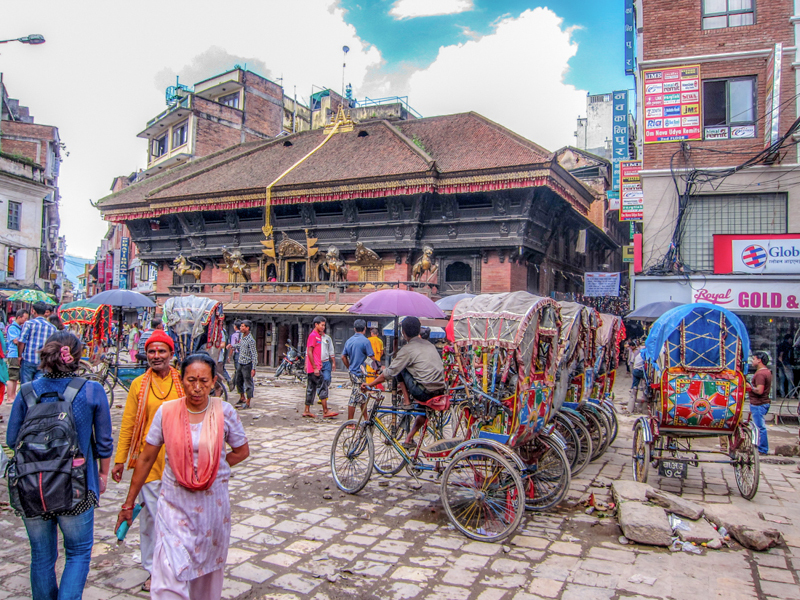 It is 90 minutes walk from Thamel through small Kathmandu streets. 15 minutes by cab for about 150 NPR. Beware of Monkeys, they might not attack but they are thieves. Just imitate a slingshot movement, they are used to local doing it and they will usually go away. Price went from 200Npr (2011) to 1000 NPR to get in, about a 30 minutes walk from Thamel. 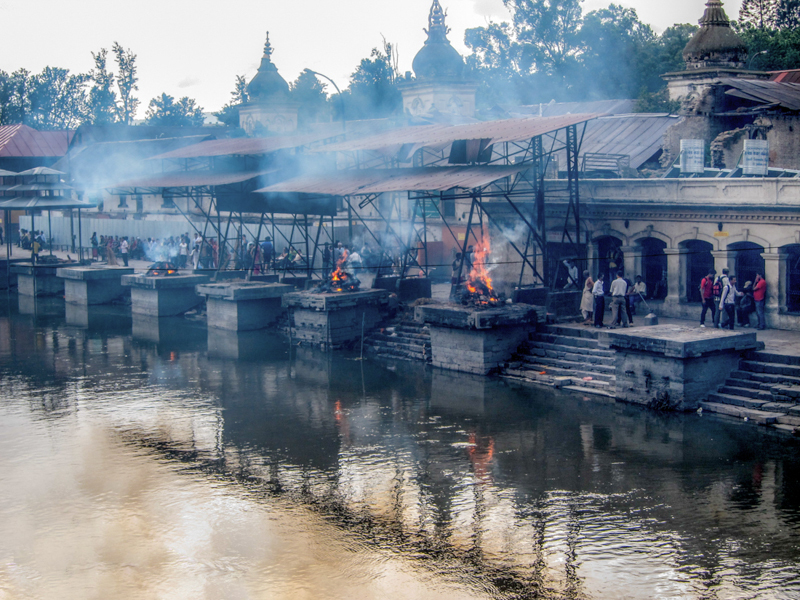 You will be able to see cremation from the opposite shore, as only the Hindus can enter the Pashupatinath Temple.